SOLD AS A PAIR BRAND NEW IN THE BOXES, QUALITY MADE,COMES WITH 2 BRAND NEW XLR WIRES, RUBBER FEETS ,PAIR OF BRAND NEW POWER CORDS. BRAND NEW. NEVER USED OR MOUNTED. Swans - M200MKII - Powered 2.0 Bookshelf Speakers - Wooden cabinet - Powerful bass and clear treble - CES Award Winner - HiFi Speakers. Made for over ten years, the M200 series is Swan Speaker’s oldest premium bookshelf speakers. NEW UPGRADES - Adpoting higher resolution tweeters and more contemporary interfaces, such Bluetooth and Optical etc. Unpaid cases will automatically be open. What's not included. 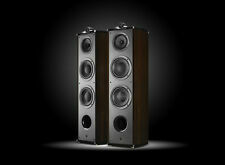 New Swan Speakers - M20-5.1 - 5.1 Powered Bookshelf Speakers - Wooden Cabinets. Condition is New. Shipped with USPS Priority Mail. Swans Diva 8.3+ HIFI Home Theater SPEAKER Pair New ROSEWOOD GLOSS! Dealer COST! Included in the system is WE HAVE MANY MANY OTHER SWANS SETS AVAILABLE INCLUDING THE. Swans manufactures only Hi-End Systems. They have won several awards for their designs at CES and other well known Electronic Expos. Swans 2.3+ ULTRA AUDIOPHILE Home Theater Speaker PAIR - CHRISTMAS DEALER COST!! 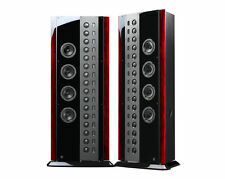 We have MANY Swans Speakers - just get in touch - we are 10 years DISTRIBUTOR! WE HAVE MANY MANY OTHER SWANS SETS AVAILABLE INCLUDING THE. We can also upgrade the woofers 4 x 250 Watt Power handling and higher efficiency AUDIOPHILE sound. Swans 2.8+ ULTRA AUDIOPHILE Home Theater Speaker SPECIAL!! DEALER COST!! We have MANY Swans Speakers - just get in touch - we are 10 years DISTRIBUTOR! WE HAVE MANY MANY OTHER SWANS SETS AVAILABLE INCLUDING THE. 2.8 Gloss Piano finish in Rosewood, F10 with Massive 15" Subwoofer, 1808 PRO with 1200 Watt RMS Massive 18" Subwoofer. 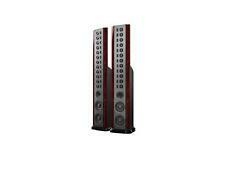 Swans 2.6+ Home Theater PAIR SPECIAL Dealer cost! ONLY UNTIL Sold! Swans manufactures only Hi-End Systems. They have won several awards for their designs at CES and other well known Electronic Expos. Trax Audio is the only importer in the United States. You will not find any other Hi End systems at these prices anywhere. This is one of the best value speakers in this price range. Included in the system is 1 - S600D Center Speaker - 2 Way with Ribbon Tweeter. 2- S600D Rear Surround Speakers. Swans manufactures only Hi-End Systems. 1 - S600A Center Speaker. 2- S600A Rear Surround Speakers. Swans S600A. Swans manufactures only Hi-End Systems. They have won several awards for their designs at CES and other well known Electronic Expos. Swans PRO1808 Home Theater Speaker AMAZING 18" SUB, MID, 4 RIBBONS DEALER COST!! WE HAVE MANY MANY OTHER SWANS SETS AVAILABLE INCLUDING THE. 2.8 Gloss Piano finish in Rosewood, F10 with Massive 15" Subwoofer, 1808 PRO with 1200 Watt RMS Massive 18" Subwoofer. 1200 Watt RMS HUGE 18" Subwoofer gives you bass down to 20 HZ! All speakers work fine and were well kept! Huawei AM08 is a portable speaker, which is characterized by a swan shape. This speaker Huawei has a size of about 10cm on each side, has a power of 1.8W and a battery of 700mAh that allows it to resist 4 hours of playback! The Diva Swans 6.1 Loudspeakers. Diva Swans Set of Pair: 6.1 Tower a very good condition. It is only one blemish it shown on the picture. Because of weight only Local pickup. Nominal impedance: 8 ohm. Excellent set of Diva Swans speakers including 2-6.1 tower speakers, 1-C3 center channel, and 2-2.1 bookshelf surrounds. Offered buy it now or best offer. If not interested in the full set or shipping please message me to discuss details. Swans Speakers M100MKII 2.0 Bluetooth Bookshelf Speakers. 2.0 PROFESSIONAL BOOKSHELF SPEAKERS - Get convenient high fidelity sound, since the speakers are endowed with premium acoustic and added powerful internal amplifier. (If you receive an item and it doesn't work properly or you don't like it because of any reason at all. c) If item was opened, any parts removed or repaired by any unauthorized person. The warranty shall not apply to the following circumstances. Swan Speakers - M20W - Beautiful Powered 2.1 Living Room Laptop Speakers - 6" Subwoofer - Rosewood with Pink Gold Aluminium Drivers and Piano Finish - 50W RMS Internal Amplifier. Item model number: M20W. Swans Speakers. - Source Input: Line 1 / Line 2/ Bluetooth 4.0 / Optical / Coaxial. NEW UPGRADES - Adpoting higher resolution tweeters and more contemporary interfaces, such Bluetooth and Optical etc. If you receive an item and it doesn't work properly or you don't like it because of any reason at all. The warranty shall not apply to the following circumstances - Local pick up is not available. Swan Speakers. If you did not receive our reply. Swan Speakers Bookshelf - M50W Powered 2.1 HiFi Music Listening System Wooden "
Swans Speakers Bookshelf - M100MKII Powered 2.0 Wireless Bluetooth Wooden 4'' "
Swans (HiVi) M-200 Powered Bookshelf Monitor Speakers FOR PARTS/AS IS. Condition is Used in good physical condition however there is a lot of buzzing when turned on and not a lot of sound output when hooked up to a source. Shipped with USPS Parcel Select Ground. The classy black and white casing makes the Swans M10 a truly vogue product. Swans M10 adopts acoustic friendly real wood enclosure, keeping resonance to a minimum. M10 is also a magnetically shielded system, so it is safe for electronic devices. Swan Speakers - M10 - Powered 2.1 Computer Speakers - Surround Sound - Near-Field Speakers - Bookshelf Speakers - Pearl White. Item model number: M10. While lW3 produces neutral sound, LW5 is more dynamic for the woofer. Therefore, they're well matched to reproduce natural sound. Swans Speakers - M10 - Powered 2.1 Computer Speakers - Surround Sound - Near-Field Speakers - Bookshelf Speakers - Pearl White. (The warranty shall not apply to the following circumstances - Local pick up is not available. c) If item was opened, any parts removed or repaired by any unauthorized person. Your item for sale. D-bt, Edifier R1700BT, R1600TIII, Swans D1010, 4-pin Speaker Cable, Headunit and Auxiil iary connector cable, D-bt (6.5ft(2M)). Length: 6.5ft(2M). Edifier R1700BT, R1600TIII, Swans D1010,Headunit and Auxiiliary connector 4-pin Speaker cable.